For an effortlessly smooth shave, men need to have the right tools to achieve a clean look. Shaving properly takes more than rubbing some shaving cream or gel on your face and removing it with a razor. For that reason, a great device to have on hand is a shaving cream warmer. It gives users a clean, smooth, and comfortable shaves every time. With all the options on the market, it can become difficult to find the right warmer. 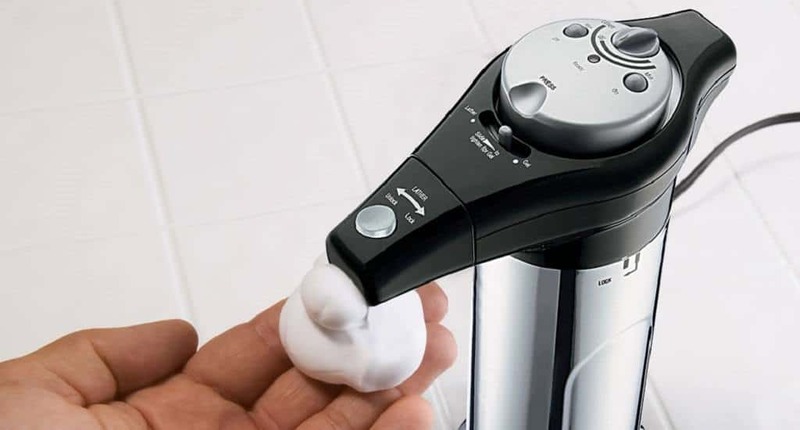 We created this guide to walk you through everything you need to know about shaving cream warmer (dispensers) to narrow down your search and get you one step closer to perfection. A shaving cream warmer is a device that heats up gel or cream prior to shaving. It is an effective tool that opens up pores in the skin by warming up the skin and prepping it for an enjoyable shaving experience. 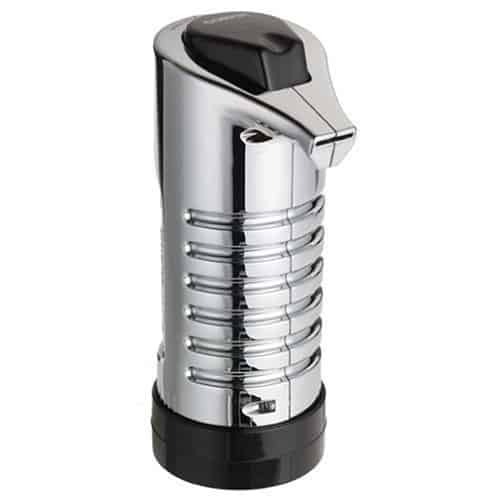 Even for men with sensitive skin, a shaving cream warmer dispenser makes shaving with a straight razor quick and easy. Shaving gel and cream are both substances used in the act of shaving one’s beard. While they can be used for the same purpose, they still hold distinct differences. Which one is better? This all comes down to personal preference since every man has different likes. Shaving gel offers a quicker shave than cream. Shaving cream very rarely clogs the razor as opposed to a gel. When compared to shaving cream, a gel is more expensive. 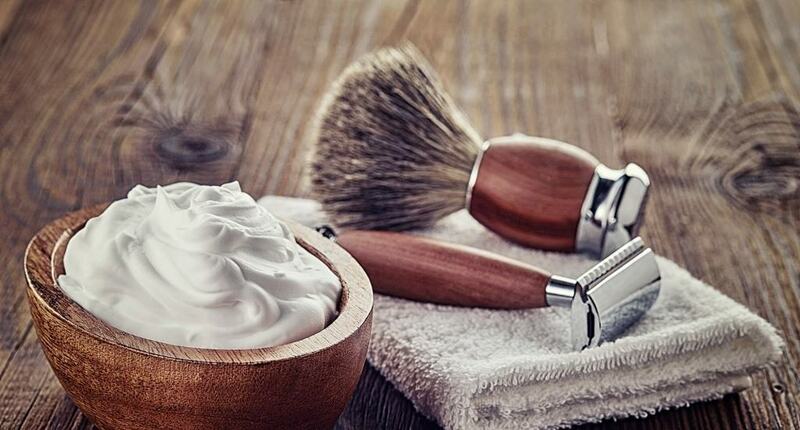 Since many shaving creams are glycerin-based, they keep your skin from getting dry. Shaving gels are mainly scent free. Typically, men with sensitive skin or manicured facial hair use shaving gel. All in all, either option can be used with a shaving cream warmer, and it is especially recommended to indulge in an enjoyable shave. Not only will you look good, but you’ll feel good too. You may be wondering if you need this warming device and the short answer is, yes! You will come across several benefits once you invest in a shaving cream warmer dispenser, the most obvious one of them being how good it makes you feel. Lathering your face with cold shaving cream is not ideal – especially during the colder months. Shaving cream warmers make getting ready for the day easy by giving you a nice, warm shave. You won’t have to worry about irritating your skin or the razor tugging on your beard hair. Another benefit is when you warm up your shaving cream or gel, it opens your pores, consequently, getting the razor closer to the skin. This results in a cleaner shave and leaves skin soft. Opened pores are especially important for men with sensitive skin since they’re more prone to razor burn. Moving forward, a shaving cream warmer makes it easier to lather on cream or gel onto the skin. It is able to be applied much smoother than when cold. Additionally, warming up your cream beforehand will save your product by making it easier to distribute evenly on your face. The final benefit we want to share with you is if you want to grow a beard faster, it’s a good idea to begin with a warm shave to get a good base going. This will help the beard grow in evenly. Along with this, you’ll want to learn how to trim and shape your beard for the best results. Shaving cream warmers dispenses are beneficial in so many ways. They open pores, soften whiskers, and allow the razor to pass smoothly over your skin. If you prefer one over the other, find a dispenser that is optimized for the option you prefer. Some models work best with one or the other while there are warmers that work just fine for both. You want a shaving cream warmer that’ll be able to handle different shaving cream or gel types/sizes despite the brand. Consider how much room you have in your bathroom countertop. You don’t want your warmer to take up too much space or perhaps you prefer to have it stored away. If this is the case, find one that’s easy to set up and put away. Some dispensers are designed with a light indicator that alerts you when it’s ready to use. You want to be able to control the heat settings to avoid irritating your skin. Once it heats up, a quality model will keep the heat even and constant. Do you need it for home use only or do you plan on taking it with you as you travel? Keeping these factors in mind when making a selection will give you a more comfortable and enjoyable shaving experience. Can You Use Cream, Gel or Both? Warmers work for both cream and gel cans. Whatever you decide to use depends completely on your preference. If you prefer to use cream cans, get a warmer specifically designed for creams. The same can be said for shaving gel canisters. There are options that are compatible with both options if preferred. The price of a shaving cream warmer varies depending on features, specs, and whether you’re needing one for your home or professional use. They can range anywhere from $20 dollars to over $200 dollars. With this being said, you can easily find a dispenser that fits your budget. You want to clean your dispenser regularly to avoid clogging. Fortunately, these machines are easy to clean or maintain. To clean, use soap and warm water to remove any excess or unwanted product. Wipe it down and store it away until it’s time to use again. Treating your dispenser properly will give you years of shaving delight. Before we conclude this post, we’d like to share one final piece of advice. It’s important to know how to shave, not just for looks but also for proper beard growth. Learning how to use the right tools and products, such as beard balm, will allow hair to grow smoothly and healthy. What is a beard balm? Visit our other posts to find beard care products explained. We hope the information provided has helped you narrow down your decision for finding the right shaving cream warmer (dispenser) for you! You are now equipped with knowledge about how to choose the best shaving cream warmer dispenser. However, you might still be confused about which one to choose, especially if so many of them check all the boxes for you. Using the Conair Gel and Lather Heating System is very simple because of its excellent design, sleek look, and one-handed operation possibility. You can use this device to heat both the shaving cream and the gel too. Preserving their consistency gets easy thanks to the variable temperature control. 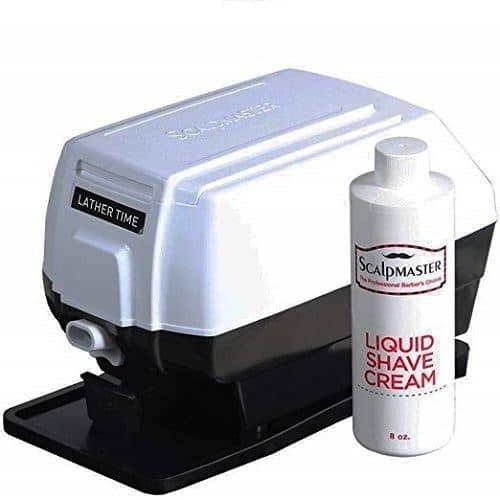 This warmer dispenser is extremely simple to use, and it quickly makes your favorite shaving cream or gel hot to provide you a smooth, close and comfortable shave. The hot lather is crucial because it softens your facial hairs, which then decreases the possibility of irritation, tugging and pulling when you shave. The device won’t make your cream too hot. Instead, it will make it warm, something like body temperature. To heat it up more, adjust the temp selector in the correct position. The dispenser features a ready indicator light and a one-hour timer built-in, so you always know when your cream is ready. Finally, the gel nozzle dispenses easily. Made for the professional barbers or for all the guys that want to feel that way, Lather Time Professional Hot Lather Machine creates a thick and smooth lather every time. Powerful long lasting DC motor will extend your machine’s life, while a simple push button will ensure an easy dispensing. While operating, you won’t hear any annoying noise from this product, like with most other warmer dispensers. The rubber pad is a great addition that provides a non-slip surface where you can rest your device after shaving. To ensure that you have a whole day supply, the manufacturer created one extra large soap cup. You will also find one convenient cleaning brush and an 8 oz bottle of liquid shave cream in the package, so you have all you need for a pleasant shaving experience in one place. Experiencing the luxury of a thick, rich and hot lather shave has never been easier than with Conair Chrome Hot Lather Machine. One thing that is important to mention in the beginning is that you can’t use this device with your shaving gel. It is meant to be used only with shaving cream. Designed for comfortable, one-hand use, this warmer dispenser works with any brand standard or large size shaving cream can. Its deluxe chrome finish complements any bathroom decor, but the most important thing is the time needed for the lather to heat up. You will love the fact that this product heats it up in about one minute. Ready indicator lights will turn green inform you when the process is finished. To start heating your shaving cream simply remove the bottom place, place the cream there and shake the device before turning it on. That’s it! Photos from: londondeposit / depositphotos.com, Koufax73 / depositphotos.com.